Victoria has developed a comprehensive method for workshop instruction involving how to make a technical dancer fluid and a performer technical. She shapes each workshop to include topic understanding, practice, and application so that students are comfortable with the material. Victoria is internationally recognized for her unique fluid dance style and effortless execution. She emphasizes all these topics in her workshops. Read more students experiences here. 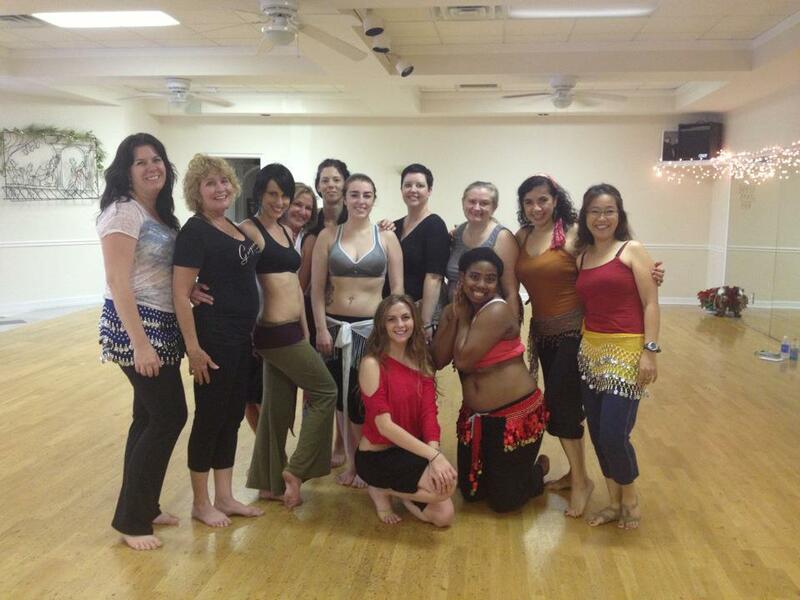 Throughout belly dance training, dancers focus on making accented movement sharp, strong and large for the stage. Movements become extremely strong but the rest of the body can become rigid with executing the accents. This class concentrates on how to keep the strength and size of your accented movement and combine it with overall body fluidity to create a strong yet graceful dance. Students will learn Victoria’s method for maintaining grace throughout each performance while applying the concepts through combinations and drills. Who doesn’t love a juicy undulation or heavy hip accent? Victoria has always been fascinated with mega-sized movement and how to train the body for this. Over the years, she has created a method to increase movements’ size by balancing strength & flexibility. In this workshop, students will learn drills they can use at home to increase the range of motion of shimmies, accents, and undulations. With this piece of music, it can be difficult to add variety in movement and showcase the difference in drum beats with belly dance. Learn how to shape your shimmies and accents to enhance the variety of sounds in a drum solo. Victoria will provide drills and combinations to enhance your practices and develop your technique for drum solos. Fluid traveling steps, turns, and arm movements can enhance any performance. Learn through drills and combos how to balance the juicy motif of belly dance with these lyrical movements to maintain your dance identity as a belly dancer with beautiful lines. Learn how to transform your dance from 1-2-3-4 counts into a seamless combination of movements. Victoria explains how to combine your belly dance technique in order to create an endlessly flowing and exciting performance with six crucial concepts. In addition to studying these concepts, students will learn a choreography emphasizing the elements of fluidity. Get ready to sweat! This workshop is packed with muscle building drills Victoria uses daily to strengthen her technique. She teaches ways to develop not only your stamina and grace but also your layering and traveling skills. The drills are adaptable for any dance level, so jump in and get ready to train. Make sure to bring a bottle of water and even a towel. Victoria will introduce a new method and variation on the ancientAsian-influenced prop, flutter fan, in this workshop. Inspired by the breathless and elegance of Chinese silk, the Teel Fan method presents techniques & combinations used to create beautiful fan dancing. No prior experience with fan veil is required or necessary. Add richness to your dance with core isolations. Victoria explains how to identify, strengthen, and use all sections of your abdomen to enhance your techniques. This workshop includes strengthening drills and combinations to help execute and layer a variety of movements. Don’t let your veil drag you down! Learn Victoria’s unique veil technique that is internationally recognized. She covers concepts of how to effectively incorporate your veil into your dance, how to prevent veil malfunctions, and how to enter and exit with the veil. To demonstrate these concepts, students will learn a mini choreography. Experience with the veil is highly encouraged for the workshop. Make sure to bring your veil. Love Spanish guitar? Love Oud? This choreography takes the similarities in these two music styles and blends them into a modern taqsim that will spice up your dance. Apply Victoria Teel’s fan method into a choreography. It is recommended to have prior experience with fan veil or the Teel Fan method for this workshop. Learn one of Victoria’s favorite drum solos that encompasses the contrast of strength and fun. This piece is filled with powerful technique mixed into playful combinations. Learn another one of Victoria’s favorite drum solos that encompasses the contrast of strength and fun. This piece is filled with powerful technique mixed into playful combinations. Learn to blend the softness of silk as well as the power silk can add to any dance with Victoria’s Modern Veil choreography. Each student will explore the variety a veil can add to your performance. This new entrance choreography includes lyrical traveling steps, folkloric footwork, powerful hip work, and juicy taqsims. Love many styles of belly dance? Dance to a fun yet dramatic oriental choreography that combines Egyptian, Cabaret, and Spanish fusion styles to the amazing compilation "Raqs el Helwa".